The Douglas B-66 Destroyer is an American strategic bomber. It was used by the US Air Force during the Cold War and the Vietnam War. It could carry a nuclear weapon. It is a variant of the A-3 Skywarrior. It was used between 1956 and 1975. 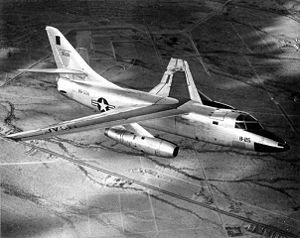 Some variants were built as reconnaissance aircraft or electronic warfare, as RB-66 and EB-66. ↑ "Douglas B-66 Destroyer." Archived November 16, 2007, at the Wayback Machine National Museum of the United States Air Force. Retrieved: 5 August 2010. This page was last changed on 19 June 2018, at 02:20.